Injunctions for protection, also commonly referred to as restraining orders, continue to serve as a potential pitfall for non – United States citizens. Injunctions are extremely easy to obtain and little evidence is required to obtain one. Often, a judge will issue an injunction based solely on the word of the person who filed for the injunction. That person may have ulterior motives to obtain the injunction, for example to gain leverage in a divorce proceeding or child custody proceeding. 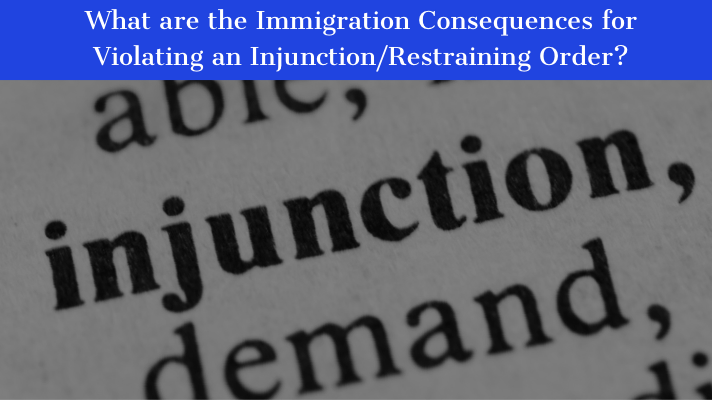 But once an injunction is obtained, any violation of that injunction could lead to deportation. A conviction is not even necessary. And even if you would otherwise be eligible for a form of relief where the judge could cancel your removal, a conviction would render you ineligible. A recent Board of Immigration Appeals decision has further solidified this position. An injunction is a court order commanding you to do things or to not do things. For example, a judge can order you to stay away from a specific person, to stay away from specific places, to go to batterer’s intervention program classes, and to adhere to many other court ordered conditions. A person can obtain an injunction by going to the courthouse and filling out a form alleging that they are in fear of future violence because of something the respondent has done or said in the past. An injunction can be granted based on nothing but that person’s own words. The court will typically issue a temporary injunction and set it for a hearing. At a hearing, the judge will listen to you, the petitioner, any witnesses and will look at evidence that the petitioner or respondent submits. The burden of proof is extremely low and if the judge feels that there is animosity between the two people will often err on the side of issuing the injunction. However, this can have a significant impact on any person, but particularly for a non-citizen. In a disappointing decision by the Attorney General, a decision has been made on whether immigration judges and the Board of Immigration Appeals have discretion to administratively close deportation proceedings. 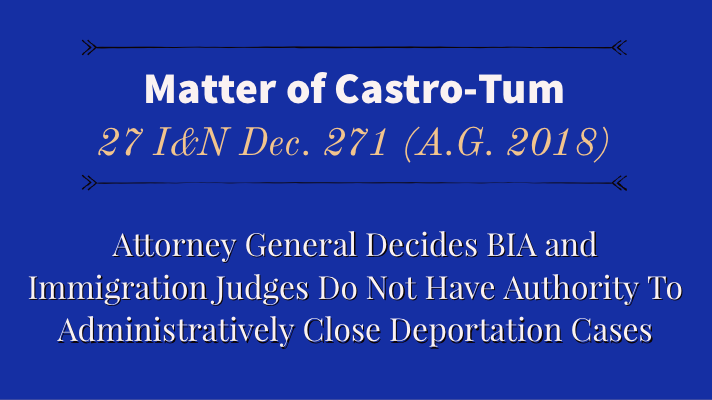 Matter of Castro-Tum, 27 I&N Dec. 271 (A.G. 2018) was decided on May 17th, 2018 after the Attorney General referred the issue to himself. Why is the Attorney General making this decision? The Attorney General has the authority to refer Board of Immigration Appeals decisions to himself to review. 8 C.F.R. §1003.1(h)(1)(i). In this case, an Immigration Judge granted several continuances to a juvenile who had been issued a Notice to Appear for deportation proceedings. The Notice to Appear that was handed to the juvenile did not give a date for a hearing. Notice of the hearing was sent to the address provided by the juvenile. When the juvenile didn’t appear for court, the immigration judge continued the case and ultimately administratively closed the case. The government appealed and the Board of Immigration Appeals remanded the case for the Immigration Judge to proceed with the deportation proceedings and to issue an order of removal in absentia if the juvenile did not appear. The Attorney General then referred the decision to himself. The Attorney General’s decision is binding on the Board of Immigration Appeals, which is the appellate court that rules on all appeals from Immigration Judge decisions. I Have A Criminal Conviction That May Get Me Deported. What Do I Do? Criminal convictions are a primary basis for deportation or denial of immigration benefits, like greencards, visas, and naturalization. A criminal conviction can have devastating consequences on your immigration options. Some convictions may result in deportation. Some may not. Immigration is controlled by federal law. Most convictions are based on state law. 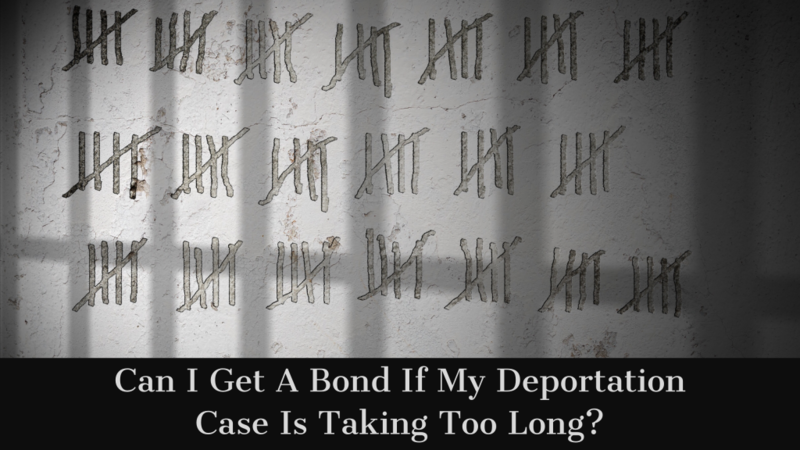 Whether a state conviction qualifies as a deportable offense under federal law is often a complicated analysis that is commonly litigated in courts across the country. The best course of action when you are charged with a crime is to consult with an experienced immigration lawyer who has criminal law experience. Then make sure your criminal defense lawyer and immigration lawyer discuss the best options for your criminal case and how a conviction will affect your immigration case. But what if it’s too late? What if you already have the criminal conviction and are only now being told that you can be deported because of that conviction. Or what if you are being told that you can’t apply for an immigration benefit because of your criminal conviction? Once you plead guilty or no contest or are found guilty by a jury, it becomes increasingly difficult to fight your conviction. However, there may be an avenue of hope. The law in the State of Florida allows you to go back two years to challenge a conviction if your criminal defense attorney made certain mistakes. For example, if your criminal defense attorney did not properly advise you of the immigration consequences of your criminal conviction, you may be able to reopen the case and negotiate a more immigration friendly plea. 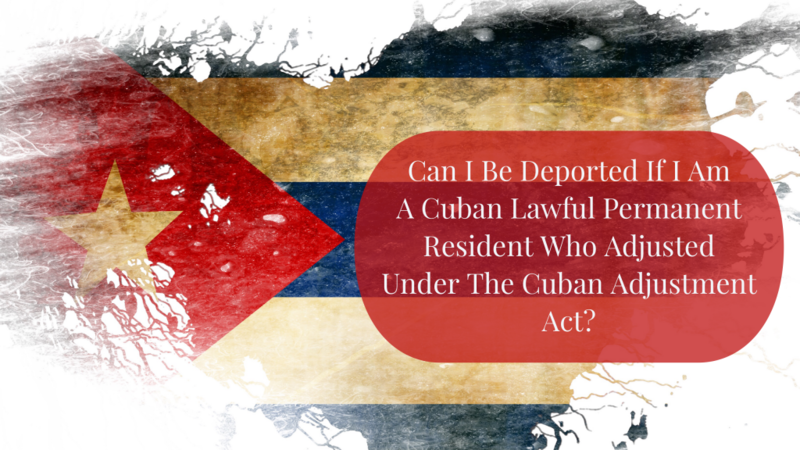 Can I Be Deported If I Am A Cuban Lawful Permanent Resident Who Adjusted Under the Cuban Adjustment Act? We’ve had many Cuban clients who had a false sense of security when it came to their immigration status as a Cuban Adjustment Act Lawful Permanent Resident. 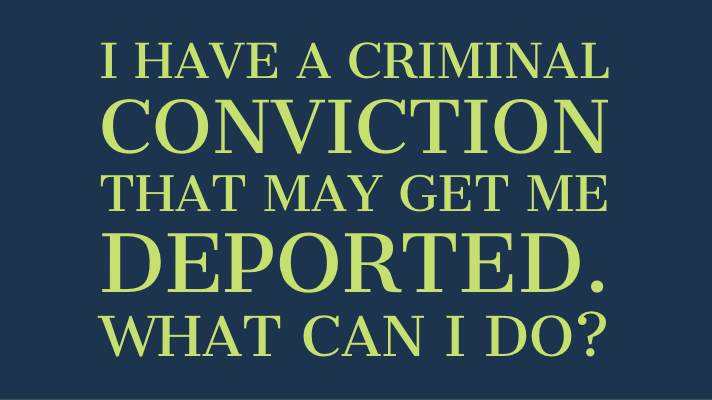 They think that if they are convicted of a deportable crime, they will not be deported. Although historically this has been the case, times are changing and more and more people are and are going to be physically deported to Cuba. If you were convicted of a deportable offense, even if that conviction was decades ago, you would be subject to being placed in removal proceedings at any point in the future. In other words, there is no statute of limitations for deporting someone based on a criminal conviction. If you were placed in removal proceedings and ordered removed, but weren’t physically deported to Cuba because of existing relations at the time, you also can be deported based on that prior order at any time in the future. The only thing standing between you and physical deportation to Cuba is whether Cuba accepts you back and whether U.S. policy to physically deport Cubans becomes more widespread. So, once relations between Cuba and the United States thaw and certainly if the Cuban government transitions to a democratic government. 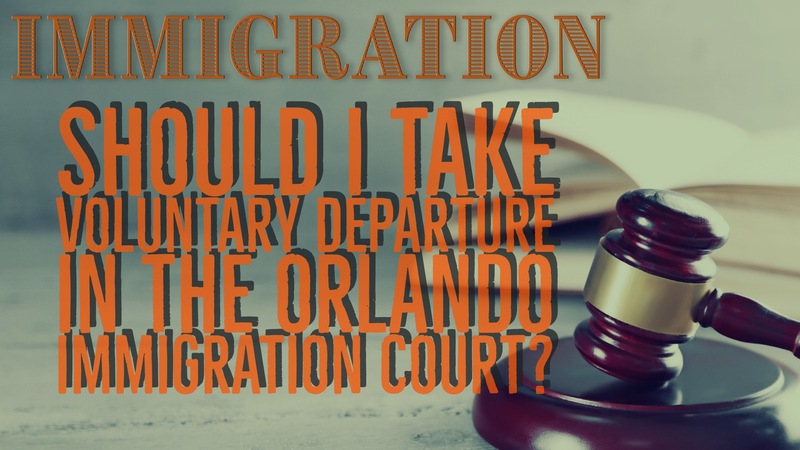 Should I Take Voluntary Departure in the Orlando Immigration Court? Sometimes, there just is no relief in deportation proceedings that will allow the person to stay here. Whether it’s because of lack of ties to the United States, lack of hardship to U.S. citizen relatives, criminal history, or other factors, you just may not be eligible under any provision of the Immigration and Nationality Act to remain in the United States. No cancellation of removal. No waivers. No asylum or withholding of removal. Your immigration attorney has looked at your case from every angle and there just is no possible way to keep you here. In those cases, there is often one last option that may have some very beneficial consequences. It is called Voluntary Departure. Florida immigration attorneys often request voluntary departure in the Orlando Immigration Court in both detained and non-detained cases. So what is Voluntary Departure? Voluntary Departure is a form of relief that allows a person to leave on his or her own rather than under a removal (deportation) order. Although, the person does have to leave the United States, it can have some really important benefits that help the person lawfully come back into the United States on a later date.